T-Rex, are you really alive? After years of planning, the award-winning BBC television series Walking With Dinosaurs will come to life in a stunning world premiere in Sydney at the Acer Arena. How do you breathe life into a dinosaur? Or create a life-size dinosaur to thrill or frighten children? Start with 296m of fabric stretched over 132m of foam. Stuff the contraption with a kilometer of cabling, six hydraulic motors and a dozen truck batteries. Programme 24 computers to control the reptile’s every move and cover with 200 litres of paint. Finished product: A two-tonne Torosaurus that stomps, snorts and roars on remote-controlled demand. The horned herbivore is one of 15 animatronic dinosaurs making their world debut yesterday in Sydney in a stage production of the popular BBC documentary, Walking with Dinosaurs. “Walking with Dinosaurs, the Live Experience” is “the closest you’ll ever get to experiencing what it was like when dinosaurs walked the earth”, the promotional flyer promises. Walking with Dinosaurs is a 1999 six-part television series produced by the BBC, narrated by Kenneth Branagh. The series uses computer-generated imagery and animatronics to recreate the life of the Mesozoic, showing dinosaurs in a way that previously had only been seen in the feature film Jurassic Park, six years earlier. This series also recorded as the most expensive series per minute ever made in the Guinness Book of World Records. It took a year and sixty costume designers and engineers to recreate the ancient creatures, which came in two sizes – XL and XXL.Judging from the size of the beasts, you wouldn’t want to get much closer. 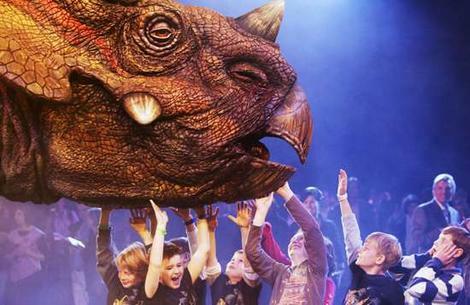 The smallest dinosaur in the show, the Torosaurus, weighs more than a family car. The largest, a long-necked Brachiosaurus, measures the length of two city buses and stands more than 11m tall. And no dinosaur show would be complete without the king of predators – the terrifying Tyrannosaurus Rex.The animatronic dinosaurs look and feel so real that even adults may be taken aback at a close distance. They bat their gigantic reptilian eyelids and gnash their sharp teeth with startling viciousness. For chief creature designer Sonny Tilders, the show was his childhood dream come true. “I certainly was a dinosaur nerd.” Tilders commented: “This is a great combination of technology and performance and creativity.” The designer also created the creatures in Star Wars Episode III, Revenge of the Sith and The Chronicles of Narnia: The Lion the Witch and the Wardrobe. Visit Acer Arena to have a real feel of dinosaur. You can subscribe your ticket from the organizer. This entry was posted on Saturday, January 13th, 2007 at 10:43 am	and is filed under Interesting Stuff. You can leave a response, or trackback from your own site.